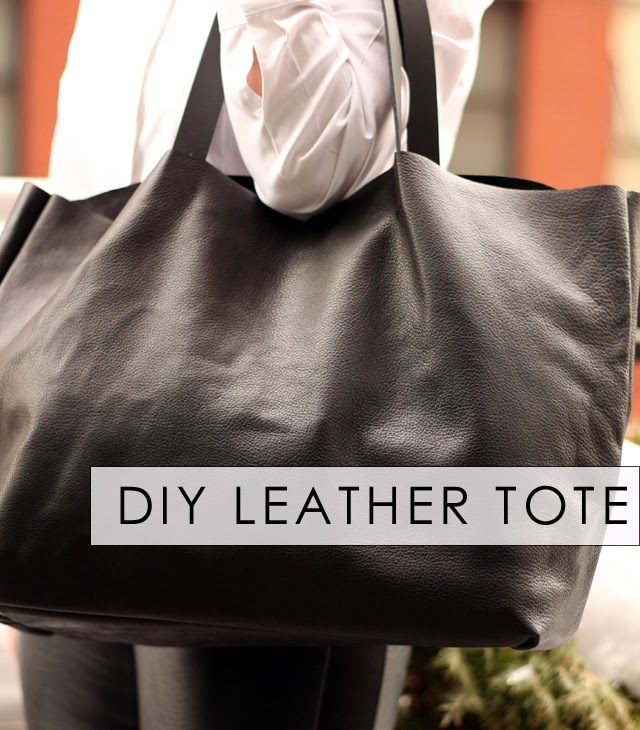 Make a DIY Celine-inspired leather tote and enter a giveaway for $50 in really great leather. Several weeks ago Leather Hide Store contacted me about doing a project. They sent me a huge piece of luscious black leather that sat in the closet for weeks because it terrified me. Turns out, working with leather is not so bad. 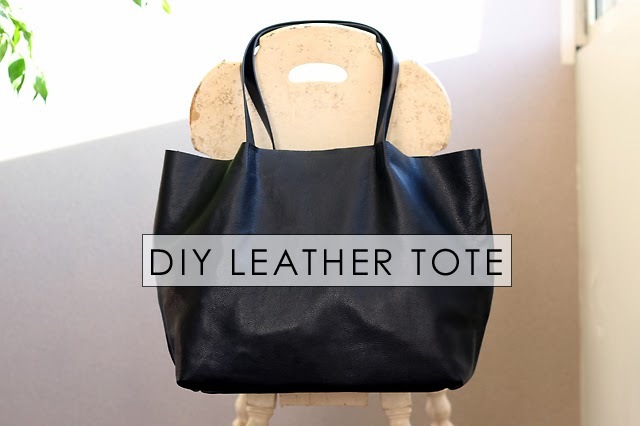 In fact, it's easier to make a leather tote than a fabric one. A piece of thick leather about 23 inches by 28 inches and another piece about 23" by about 7". The wrong side (the side that is not smooth and shiny) should be up. 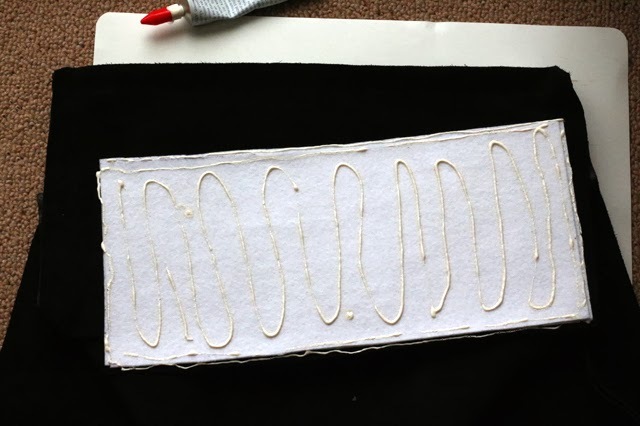 Trace around your pattern with tailor's chalk. 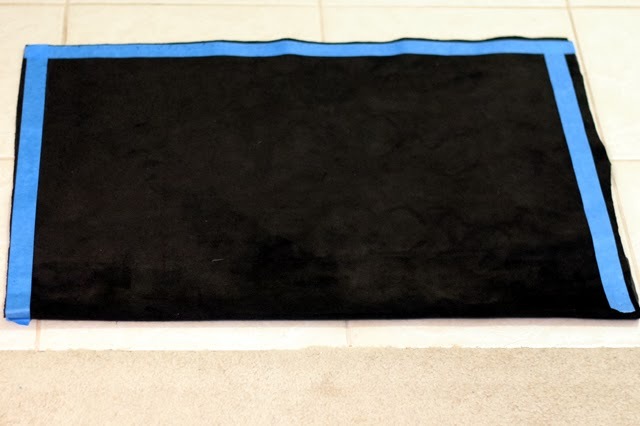 My chalk didn't work so I used blue painter's tape to mark my lines. Loosely cut out your leather. Then use a rotary cutter and straight edge to cut the leather nice and clean. Push straight down on the cutter. Roll back and forth over the same spot, kind of like a pizza cutter. After you cut out your rectangle, mark and cut out your two notches. 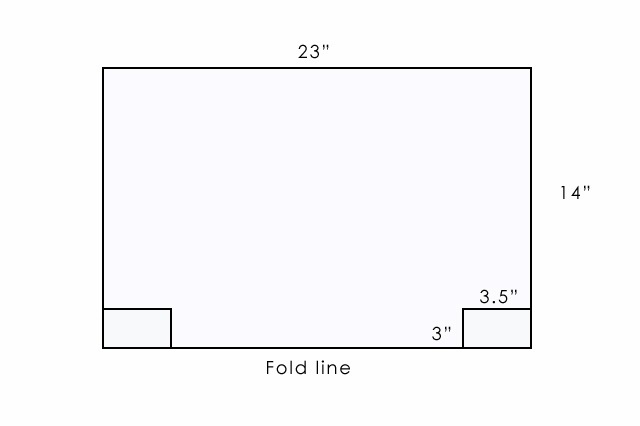 Sew up the sides of the tote with a 1/2 inch seam allowance. Box the corners and sew across the seam, as shown below. You're already most of the way there. I like a nice firm bottom to my bag. 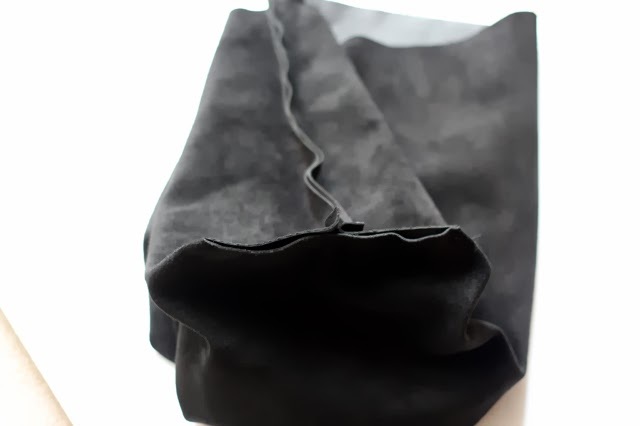 If you do to, then cut a rectangle of leather to fit in the bottom of your bag. 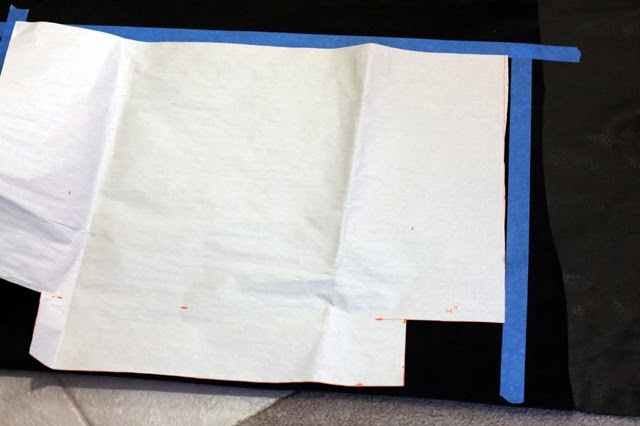 Stiffen it with fusible web interfacing. (I used two layers of 72 interfacing.) To fuse, turn the wrong side of the leather up and the shiny side of the fusing down. Put a pressing cloth over it. 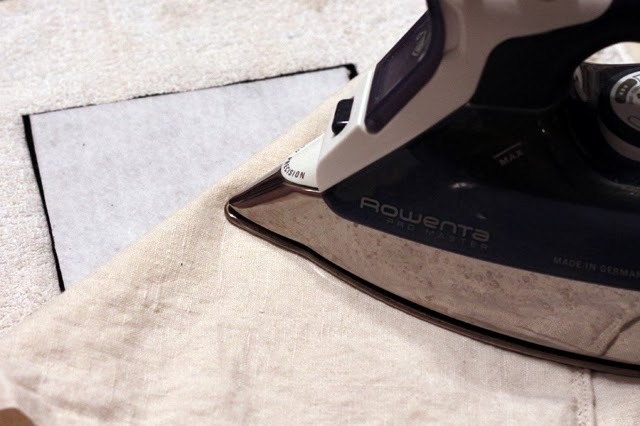 Press straight down with a really hot iron. Don't slide the iron around. Pick up the iron and put it back down to fuse the next section. Glue your bottom with the interface down into the bottom of your bag. Put some weight on it and let it dry. 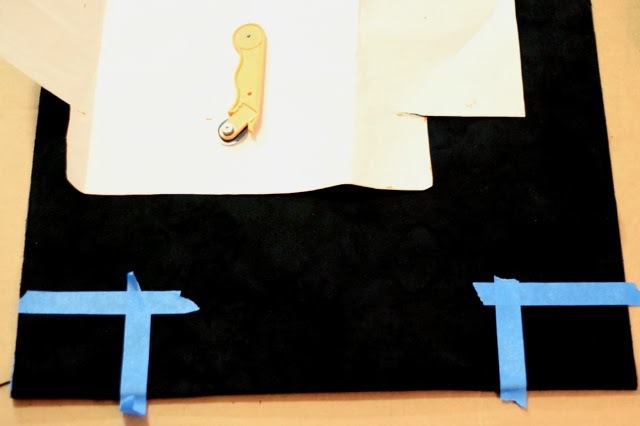 Position your handles and glue with fabric glue and allow to dry. Then hand or machine stitch to your bag. Note: Baggu puts their handles on the outside of the bag. Celine puts theirs on the inside. I opted for the thousand dollar bag version and put mine on the inside. My junk looks so much better now when toted in a REAL LEATHER tote. Easily mistaken for Celine, I think. There you have it. 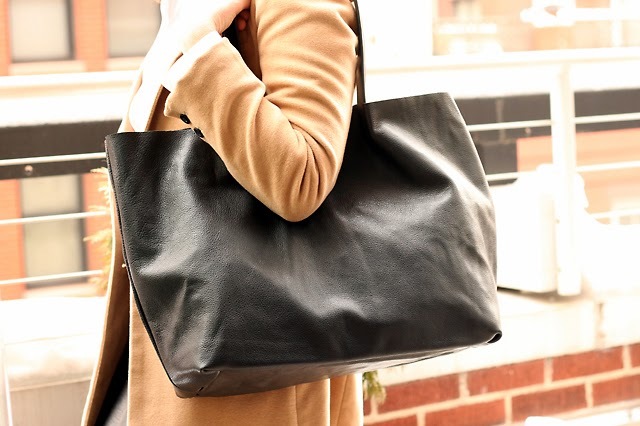 Enter the giveaway below and get started on your own rustic leather tote. 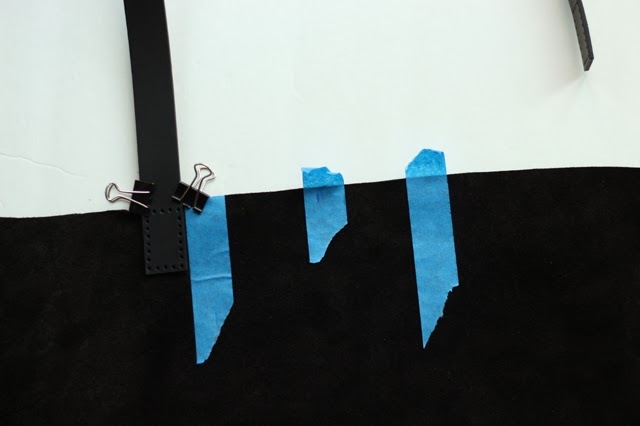 Great looking totes, both the Celine and Sam brands, The idea to mark the hide using blue tape is so helpful and I can think of several other applications for this approach - thanks! 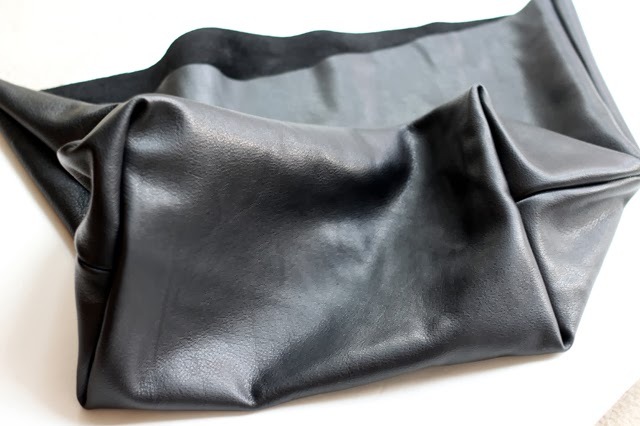 Also found the hide Facebook page helpful with leather ideas and tips; I have a leather ottoman that I put at a consignment store that hasn't sold and I've been thinking I'd bring it home and "harvest" the leather to make something, and all this gives me a bit more courage. Thanks much. I've "harvested" a few leather coats, although the leather turned out to be a bit thin. However, still good for certain things. Holy cow, this is ABSOLUTELY incredible! I can't believe you made this. My mind is blown! Is it really as simple as it seems? Because I'm about ready to go and try my hand at making my own now. This is hands down, one of the best DIYs I have ever seen! Very well done! Thanks so much! It was pretty easy, for real. And you get a huge piece of leather for $50-$60 - enough for a tote and several other projects. Thanks! I can't believe I made it either. This is seriously amazing. 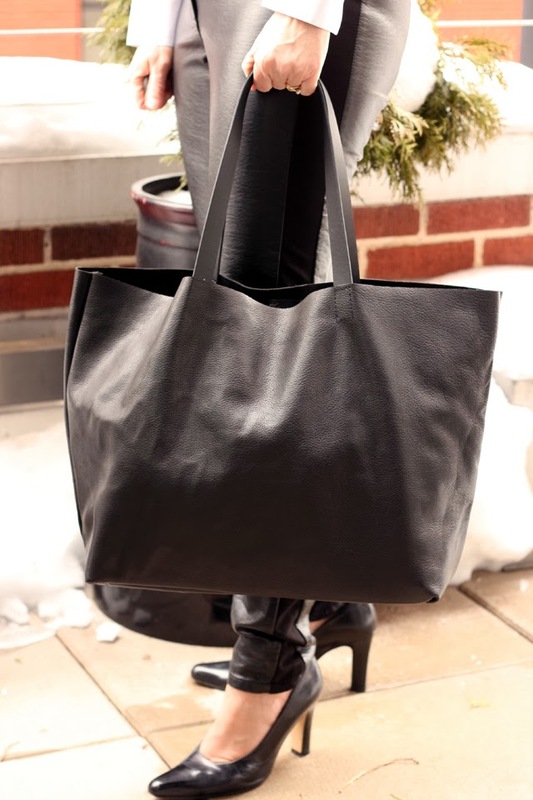 I try not to use that word too often b/c it loses meaning, but I really am amazed at how clear your steps are and how straightforward it is to make a custom tote. Color me very impressed! Thank you. Try it. It's not bad. Certainly easier than remodeling a bathroom. Hi Samantha, This tote is amazing. I would be intimidated too to work with leather but it looks like you did a fine job. I see that crafty offers a class on making leather bags. I would probably sign up for that if I were to win the leather. I just wanted to let you know that in the rafflecopter form it asks for a follow of rafflecopter on twitter and I am deducting that that is a mistake so I followed @leatherhidestor instead. 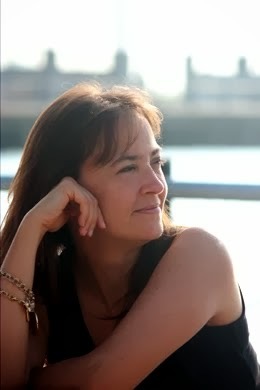 (https://twitter.com/leatherhidestor) I also looked for a link for Bromeliad on Twitter but didn't find one or I would have followed you too. Thanks for the great giveaway and the terrific tutorial. Love the bag and serious good tutorial! 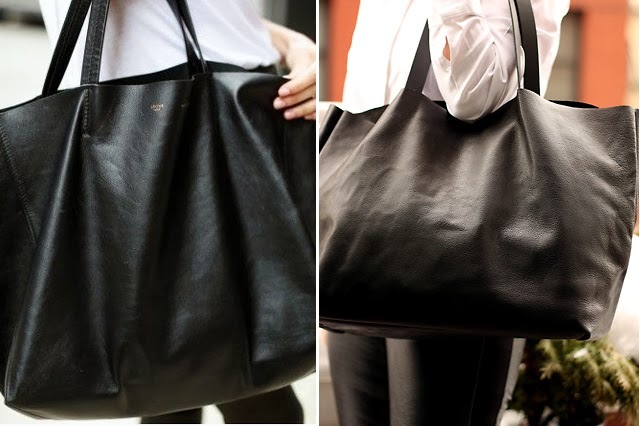 I love this DIY - I love the Celine tote, and I hope I can find similar leather in the UK to make my own! Thanks for sharing. I'm dying to try this, I hope it's as easy as it looks! You mention to get a thick piece of leather. Can you please tell me what thickness you recommend? Thanks! I'm dying to try this, I hope it's as easy as it looks! You mention to get a thick piece of leather. Can you please tell me the thickness you recommend? Thanks! I'm not sure of the technical thickness of my leather. It was thick but still floppy. I got mine from leatherhidestores.com. They can make a recommendation. Hope your project goes well! Can this be done by hand, as far as the whole bag and not just the handles? It could be sewn by hand. It would probably take a while and be kind of hard to do because of the thickness, but it is possible. I love this project and am hoping to try it soon. What machine did you use? Thanks Sharon. I used a regular Janome sewing machine. But I did use a heavy-duty needle.